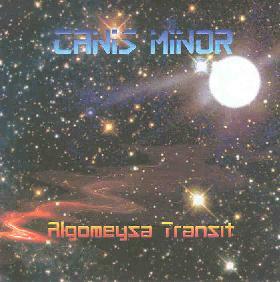 Canis Minor - "Algomeysa Transit"
The core of Canis Minor is the duo of Thom Karshish on 10-string Chapman Stick and Joe Silver on keyboards. The quick story on the band is they came to the attention of the larger space rock community when at the Strange Daze '98 Space Rock Festival they came as fans and while jamming at their campsite were recruited to fill a no-show slot. Canis Minor went on to raise more than a few eyebrows with their set and were invited back to be a scheduled band the following year. The simple description of Canis Minor's music is that it's a cross between ambient space and experimental electronica, though the pace is typically a bit rapid, and Karshish's Stick is responsible for just as much of the freaky sounds that dot the Canis landscape as Silver's keys and synths do. The Stick also gives the music a rhythmic sense as Karshish keeps the jam going at a steady stride. A couple months ago I had the good fortune to hear Canis Minor perform here in Columbus opening for Quarkspace at a performance space downtown called Madlab. I had been impressed with their performances at the outdoor Strange Daze festivals, but this is music that is better experienced in a small intimate setting, and with the added bonus of the Solar Fire Lightshow turned out to be an inspired set of pure cosmic music. A notable difference from the Strange Daze shows is at the festivals Billy "Captain America" Capozzi sat in with the band to provide spoken word rants over the band's music. At the Madlab show, and on this CD, a fellow that goes by Legion provided "subliminal vocals". Intermittently, Legion would step up to the microphone and do his vocalizations that seemed to serve the same function that a lot of freaky synth sounds might. In fact, I'm glad I got hear what this sounds like live as I would have questioned his presence if I had heard the CD first. It's very easy to get engrossed, and even quite lost, in Canis Minor's music. Watching the band perform, Karshish has his eyes closed much of the time and you can seem him getting lost himself in the groove. In fact, the band get so engrossed that each piece tends to be quite lengthy. One tune at Madlab was about 40 minutes long. And "Algomeysa Transit" consists only of the title track which is 55 minutes long. Listening to the CD now with my brain cradled comfortably by headphones, I'm hurtling through space with sound and light struggling to keep up. Ash Ra Tempel is a good analogy for the music on Algomeysa Transit as the best of Manuel Göttsching's music was a magical blend of guitar and electronic music and that indeed is what Canis Minor creates. In summary, Canis Minor will appeal to an assortment of space fans. Those who are ambivalent about electronic music can rest assured that the Stick provides that guitar element you require, and fans of electronic space music should note that Canis Minor's music is busier and more rhythmic than what you're accustomed to. Recommended. For more information you can visit Canis Minor at their web site. At the time of this writing the web site is down, so if that's still the case you can email Joe Silver at canis.a@ix.netcom.com.